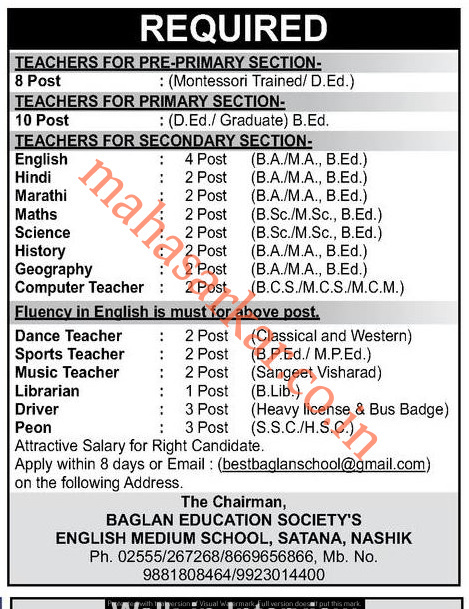 Baglan Education Society Nashik (Baglan Education Society’s English Medium School),Nashik Published Job Notification for 49 Teachers – Peon & More Posts. Candidates who wish to apply must look at Baglan Education Society Nashik Teachers – Peon & More Recruitment 2018. Eligible candidates can apply Online before 10-02-2018. Education Qualification: D.Ed /Graduate/ BA/ MA/B.Sc/ M.Sc/BCS/MCS/MCM/BP.Ed/MP.Ed/B.Lib/SSC /HSC and More. For Post wise Education Details follow the detailed advertisement. Starting Date, Last Date to Apply Online at Baglan Education Society’s English Medium School which candidates should be remembers as follows. Start Date to Apply Online: 02-02-2018. Last Date to Apply Online: 10-02-2018.